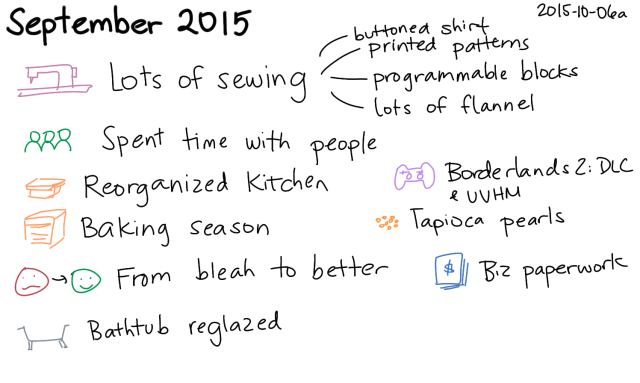 Following up on the research I did in August, I had a lot of fun sewing in September. I tried out many free printable patterns with inexpensive fabric, and I found quite a few I liked. I’ve also been learning about drafting basic blocks based on measurements, but I still have a long way to go before I’m comfortable with those. The more comfortable I get with making things for myself (and the more I enjoy the benefits of customized clothing), the more I’m motivated to put in the effort to learn even more. It was an excellent month for consulting, too: built lots of little prototypes and reports. =) My fiscal year ended in September, so I’ve been getting a head start on tax-related paperwork. Even though I fell out of the habit of updating my books weekly, it was easy to catch up on transactions and crunch the numbers for last-minute decisions. I made it out of hermit mode a couple of times, hanging out with friends and meeting interesting people. Aside from that, I’m back to long walks, hooray for feeling better! 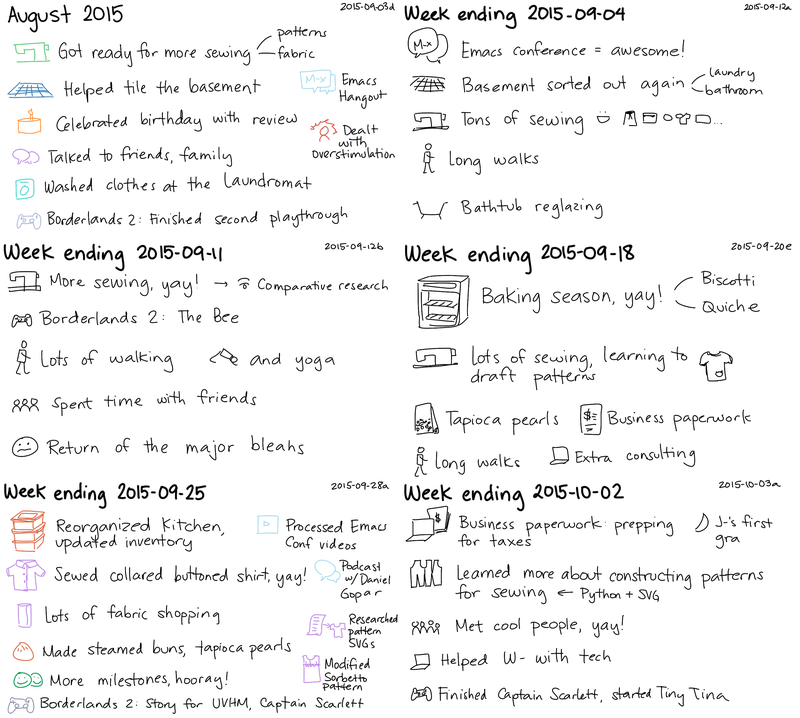 Also, lots more cooking, tidying up, and going for errands. We’ve started keeping tapioca pearls in the pantry, and bubble tea is now well within the realm of a possibility for an indulgent afternoon snack. A few other firsts this month, too: making udon noodles, making tapioca pearls… Mmmm. We’ve completed the story missions for Borderlands 2 on Ultimate Vault Hunter Mode, so I’ve been able to dial down the intensity of my video-game playing. W- bought the season pass, so we’ve been playing our way through the downloadable content. I usually join him for story missions, but I sometimes pass on optional missions and challenges. Instead, I’ve been spending a little more time drawing and thinking, taking advantage of the fact that my fuzzy brain has cleared up a little. October: More sewing, more paperwork, more consulting, and more awesomeness (I hope)!